Contains every essential oil you need & want to enjoy! "An international aromatherapy shop in a box! 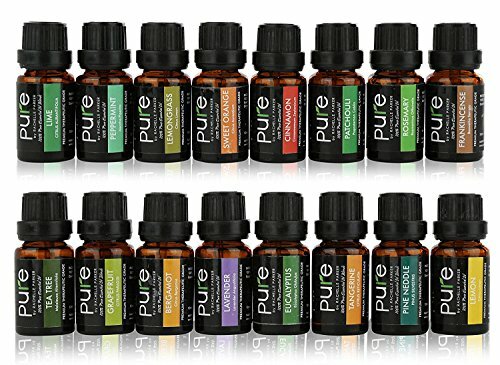 Pure Top 16 Essential Oil Collection is a hand-selected signature collection of our top therapeutic-grade oils. All oils are skillfully extracted for maximum effectiveness. Mixed with a carrier oil, or used in a diffuser or humidifier, each oil has its own unique healing and restorative properties. Pine Needle Oil (Austria) Helps heal eczema and psoriasis, boosts metabolism. PREMIUM THERAPEUTIC GRADE - No fillers, synthetics, additives, bases, or carriers added.100% Certified Pure Therapeutic Grade Essential Oil. Suggested to use with carrier oils. PERFECT GIFT SET - Each aromatherapy essential oils set is beautifully presented in a gift box, making it the perfect gift for anyone in need of relaxation. It is also the perfect starter set for anyone starting out with essential oils. MULTI-PURPOSE OILS - Our body oils can be used in diffusers, vaporizers or oil burners, for aromatherapy, during massages, spa treatments, home cleansing, bath products and for relaxing inhalation. GUARANTEE & SPECIAL OFFER - Your Essential Oil Kit comes with a free ebook. In this book you will discover the most amazing benefits and uses of our 100% Pure Essential Oil including recipes for blending the oil. Please contact us to receive your ebook. 100% satisfaction guarantee or your money back!